The other day, I saw some of the most beautiful veggies at the co-op: bright yellow cauliflower and vivid green romanesco. I grabbed one of each, along with some red bell peppers and a red onion, with the intention of roasting them all together. Romanesco is part of the Brassica oleracea family, along with both broccoli and cauliflower. It’s high in Vitamin C and low in calories. It even has a few grams of protein per cup! (I felt a cold coming on this week, so I wanted to load up on my Vitamin C-rich foods. Bell peppers have a lot of Vitamin C, too.) Plus, it’s the most amazing-looking vegetable! I loved cutting off the pointy, cone-like florets. 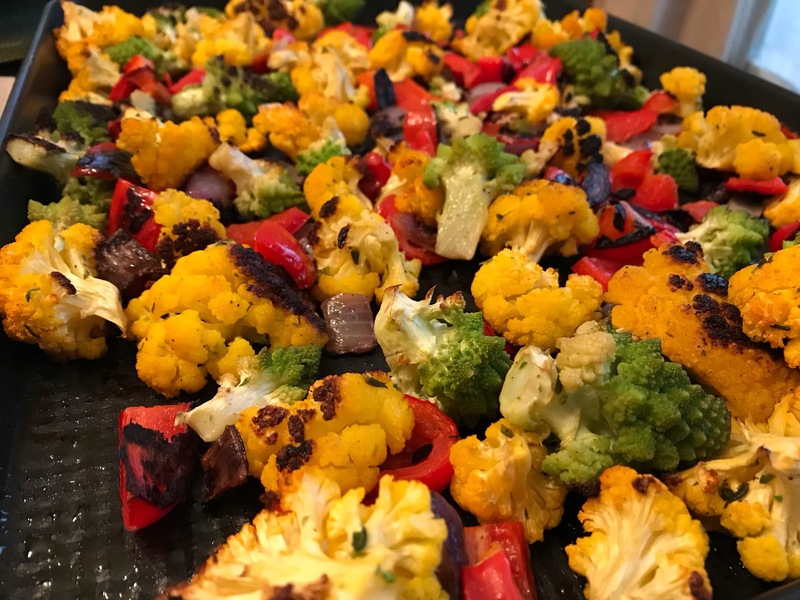 OK, back to roasted veggies for breakfast. Why not? Eating leftovers for breakfast is something I started doing during both the Paleo Challenge and my Whole 30 experiences, and it’s really a great way to make sure you’re getting enough protein in at breakfast. As a dietitian, I recommend everyone get approximately 15-20 grams of protein at each meal, including breakfast. However, we all know how easy it is to skip breakfast or just grab a bagel (maybe 4 grams protein) or a bowl of cereal (maybe 8-10 grams protein, including the milk). I sprinkled a large portion of the veggies with some parmesan cheese, Wegmans Tuscan seasoning and topped the whole thing with two eggs (14 grams protein, 7 g per egg) over easy, so the yolks spilled out over the veggies. Delish! 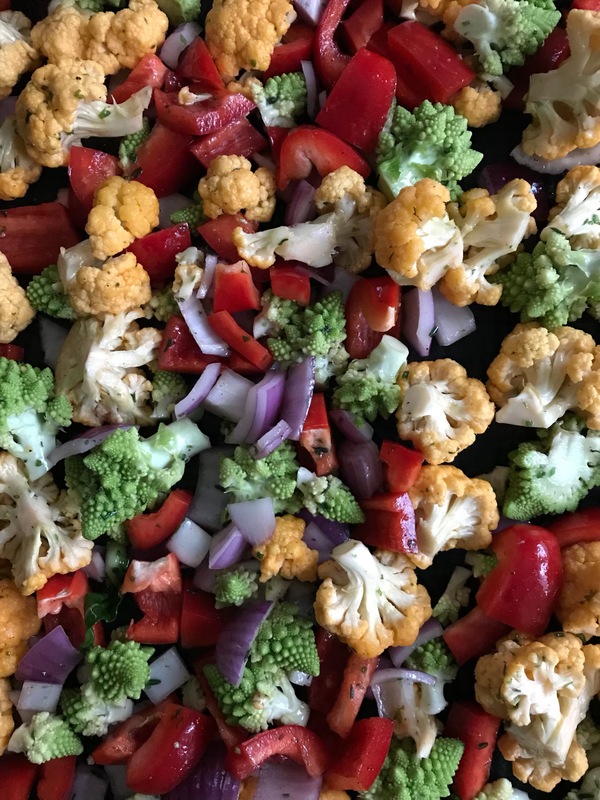 Posted on November 3, 2017 by thehealthypineapplePosted in Breakfast & Breads, By Topic, SidesTagged bell pepper, cauliflower, eat your veggies, red onion, red pepper, roasted vegetables, romanesco, veggies, wegmans basting oil, wegmans Tuscan seasoning shaker, yellow cauliflower.